Notre Dame Cathedral in Paris in 2008. Following a massive fire that ravaged the Notre Dame Cathedral in Paris on Monday, French President Emmanuel Macron vowed that the country would rebuild the landmark, and gifts from corporate giants, collectors, and individual donors began to pour in. The New York Times reports that French companies including L’Oréal and LVMH have pledged millions of dollars toward restoration efforts. The French billionaire and collector François Pinault and his son, François-Henri Pinault, plan to give $113 million through Groupe Artemis, a French holding company that owns Christie’s, among other companies. Known for his two contemporary art institutionsthe Punta della Dogana and the Palazzo Grassi in VeniceFrançois Pinault is currently in the process of opening a museum in the French capital. François-Henri Pinault is the chair and CEO of the international luxury group Kering, which includes Gucci and Saint Laurent. “The Notre-Dame tragedy strikes all French people, as well as all those with spiritual values,” he said. Collector Bernard Arnault, founder of LVMHthe largest luxury goods conglomerate in the worlddeclared that he would donate $226 million to Notre Dame. The funds will come from the Arnault family and LVMH. The group’s holdings include Dior, Givenchy, and Louis Vuitton as well as Moët & Chandon and Dom Pérignon. “The LVMH Group puts at the disposal of the state and the relevant authorities all of its teamincluding creative, architectural, and financial specialiststo help with the long work of reconstruction and fundraising, which is already in progress,” they said in a statement. Arnault opened the Frank Gehry–designed contemporary art museum the Fondation Louis Vuitton in Bois de Boulogne in 2014. The pledges of support come as no surprise. 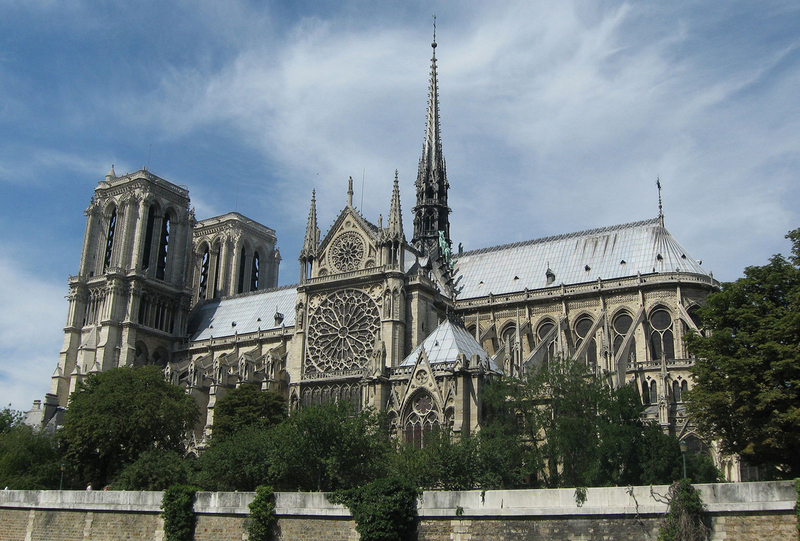 Notre Dame, one of the most beloved churches in Paris and a UNESCO World Heritage site, is a symbol of France. Luxury brands have also become known for their backing of historical restoration efforts. Tod’s, an Italian leather company, is providing Rome’s Colosseum with $28 million, and Fendi, which is owned by LVMH, gave more than $2 million to the city for the preservation of the Trevi Fountain. The cathedral, which was built in the twelfth and thirteenth centuries, is considered an unparalleled example of Gothic architecture. The religious site draws more than thirteen million visitors a year and has survived both World Wars and the French Revolution. International support for Notre Dame’s restoration is also gaining momentum. Apple pledged to help rebuild the structure, and dozens of crowdfunding campaigns have been launched on platforms such as GoFundMe. According to USA Today, the Paris Fire Service said that it took nearly four hundred firefighters more than twelve hours to battle the blaze. While no one died in the fire, two policemen and one firefighter were injured. When the first fire alarm went off at 6:20 PM GMT Monday evening, officials failed to locate the fire, which led to the triggering of another alarm at 6:43 PM. At that time, the blaze was found in the wooden framework of the church’s attic. The flames spread quickly, devouring the church’s lead and wooden roof. Once the fire was extinguished, however, officials declared that the building was still structurally sound. Firefighters had managed to put the fire out before it reached both of the church’s Medieval towers. While two thirds of the roof is gone, the French government announced that many of the priceless relics housed in the cathedral are safe. “Notre Dame’s treasury, which included, for example, the crown of thorns and the tunic of Saint Louis, is safe in Paris City Hall,” said France’s culture minister, Franck Riester. The church’s organ sustained heavy damages, and many of its paintings have been transported to the Louvre, where they can be evaluated by experts and restored. As of now, the fate of many of Notre Dame’s beloved architectural elementssculptures, gargoyles, and stained-glass windowsis uncertain.